I stopped by Scrooge’s company late on Christmas Eve to pick up some documents. I arrived just as Scrooge was handing out gifts to his employees, large warehouse-store tins of cookies. He hadn’t sounded grateful when I’d called to tell him I’d do his project. I don’t think it had occurred to him I might say no. My heart overflowed with gratitude toward Bob for recognizing my contribution. “Why…why, thank you, Bob,” I stuttered. Somewhat put out, I walked to the car. Bob didn’t appreciate my effort. He probably didn’t even know about it. But on the other hand, I wasn’t gluten intolerant. 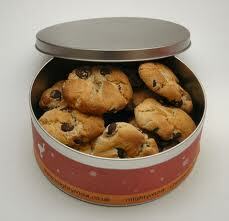 And while I had to work over the holidays, I had a giant tin of cookies to keep me company. “God bless us, everyone,” I said as I put the car in drive. This entry was posted in Blogfestivus and tagged A Christmas Carol, Blogfestivus, freelancer, freelancing, holiday stories, humor by Sarah Day. Bookmark the permalink. Appreciation comes in all sizes…a big can of cookies counts. I’ve enjoyed reading your take on A Christmas Carol. Thanks so much for joining us on the joy train that is BlogFestivus…Happy Christmas! Thanks for your nice comment and for your friendship, Julie. My best to you and yours. Love your work! And hope you had a Merry Christmas (and are gearing up for a happy new year). Thanks so much! I’m always glad to know somebody out there is reading 🙂 Best wishes to you and your family for the new year. Look forward to living vicariously through your journeys from my spot in suburbia. No, it was a great little series! Wish I’d been around to participate, even though you would have outdone me 🙂 .